Use the following suggested steps to make the most out of your participation in the Bicycle Friendly Business℠program. New and returning applicants can find detailed information on how to apply below. See the full schedule of upcoming deadlines and fee breakdown by business size. Take the BFB℠ Quick Assessment to determine whether your business is ready to apply. Review the FAQ page and program resources. 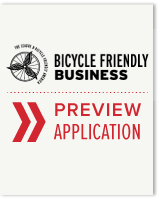 Review the PDF Preview version of the BFB application. When you are ready to apply, create an account in the BFA Application Portal to submit the online application, by visiting http://apply.bikeleague.org. Contact bfa@bikeleague.org if you need assistance in filling out the application or if you have questions. Ask your partners such as local bike advocates to review the final application draft for completeness. Upload supplemental materials such as photos or videos of cyclists and infrastructure, policy documents, maps, etc. Submit the application on or before the next deadline. Follow any instructions for next steps after the deadline, such as distributing employee survey links provided by BFB program staff. Review the Businesses page and FAQs to learn about any changes that might have been made to the program since your business last applied. 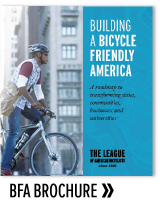 If needed, request a copy of your previous application and feedback report by emailing bfa@bikeleague.org. Review the current BFB application. Create an account in the Application Portal if you last applied before April 2016. Upload supplemental materials such as photos or videos of cyclists and infrastructure, policy documents, maps, etc. You will be prompted to attach such documents upon submitting the application.